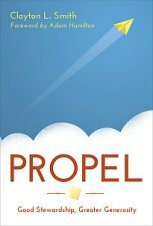 I just wrote a book review for next year’s Giving magazine on Clayton Smith’s new book, Propel: Good Stewardship, Greater Generosity. The theme of that issue of Giving is “Living Generously,” and I hope you’ll order it online at www.stewardshipresources.org this fall. But there are a lot more ideas from Propel than I could pack into that review, and one is the connection between involvement and generous giving. “Involvement is a vital indicator of generosity,” Smith says. “Those who are active members of small groups, classes, and leadership groups donate eight to ten times more to our church than those who do not get involved.” While his numbers are dramatic I think that’s no surprise, since generosity is generous-hearted living, not just financial giving. For example, when people give their skills and in-kind gifts to helping others, their time and concern to neighbors, or their advocacy and care to strangers, it all comes from the same generous heart. Generosity is not about giving money to a church; it’s about trying to follow Jesus in every dimension of our living. People who live generously share a firm conviction that a generous portion (that’s the generosity part) of what they have must be strategically given (that’s the stewardship part) for the betterment of others and for the advancement of God’s kingdom. . . . Stewardship is at the heart of the discipline of generous giving. When we’re grateful to God for God’s love and the gift of Jesus Christ, our desire to be generous in return pervades every part of who we are, not just the money part.